I looked up to see her form, tall, powerful, and full of purpose, walking toward me, the one thing I’d wanted to see since the car had swerved into my lane. Her hands swept her sun glasses from her face and stretched out toward me, asking a thousand silent questions. My only response was to pull her close – but gently – answering with my body, shielding the place where my seatbelt had burned my skin, bruised my chest and shoulder. I called 911, but ended up hanging up on them accidentally while trying to text her. There was nothing I wanted more than to have her near me. Witnesses gathered, the other driver examined his broken axle, tow trucks arrived, and I called to ask her to come to me. Over the next days we would unwind the tangle of adrenaline and fear. We would relax into the deepening of our bond. We would talk of things that come up after an accident: last wishes, emergency contacts, gratitude. But for the moment all that mattered was that she was with me. Big guys with handlebar mustaches, and pinup models pulled from magazines looked on as we held each other in the auto body shop, feeling the solidness of our bodies, sensing the solidness of our connection. I stood still, breathing into her shoulder, allowing her scent to wash over me and cleanse the smoke from my nose, her voice to take the sound of crunching metal from my mind. A few weeks ago, I got in a car accident. I’m alright, but my car’s not. I mean really not. 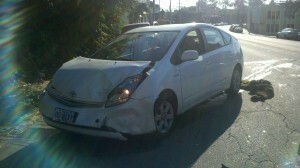 Pirus the Prius is dead. His organs will be divided up and parceled out to other cars, so I suppose he’ll live on. But it hurts. And, honestly, I’m still waiting on test results to find out how “alright” I am. For anyone who hasn’t gone through the circus show of being in a wreck, I’ll just say that it’s enough to make me consider not driving at all. The guy who hit me pulled an illegal u-turn directly into the front of my car. No idea why, other than that he “didn’t see” me. At full speed. In the middle of Santa Monica Blvd. Thank goodness it wasn’t my fault. It’s really good in terms of insurance etc. But really hard in terms of PTSD. Now, every time I feel the brakes, I get a pang in my gut, and my back and neck and shoulder. Everywhere that still hurts from being slammed into. I don’t really want to relive the incident itself, but the process afterward is something else. Immediately afterward, the 911 call was a trip. This all happened in Los Angeles, so it was the LAPD dispatch that responded to me as I sat in the smoke from the airbag that had discharged. “Is anybody injured?” this was her insistent question. “I don’t know.” I’d just been hit going 35 mph. The only thing I knew was that I could talk and that I hurt. “No. Well, yes, it’s me. I don’t know if I’m hurt.” I could see the other driver walking around his car. I ran a quick inventory of my body. Nothing seemed to be bleeding or sticking out strangely. Ambulances are expensive. I don’t have health insurance. Fuckers. Went through my brain. Then 911 put me on hold. In the mililseconds after the crash, I considered what to do. I’d just left my girlfriend’s apartment after a lovely afternoon together. She was the first person I wanted to call. But my logic told me we should get 911 in process first. Now that I was on hold, however, I decided to text her and ask her to come my way. I’d need a ride. And I really wanted a hug. Mostly, I just wanted to see her face. So I started texting. And accidentally hung up on the dispatcher. I dialed again, and went through the same song and dance, this time with a different dispatcher. It wasn’t a fair question, but I was still inhaling fumes from the airbag, and just beginning to realize that I was seriously bruised form the seat belt. And I was pissed. “Well, you’ll want to send someone to direct traffic. We’re blocking both lanes of the street.” Surely, he’d see the reason in that. People were starting to gather around the vehicles. “Okay, fine. We’ll figure it out.” Click. I was pretty much astounded. Gingerly, I opened the door and climbed out. I could walk. I could stand. I could tell I was beat up, but I was grateful that I was in one piece. My poor car, however, was a mess, crumpled and leaking everywhere. It appeared that the other guy had broken his front axle. Witnesses began to approach and we started the process of exchanging information. I called my girlfriend and she started toward me in LA’s famous rush-hour traffic. Then I sat back in my car and made another stab at getting LAPD on site. “911 emergency.” It was the same guy. What were the chances? I mean really. When the paramedics arrived, we were all walking around. I was taking pictures, and the other driver was trying to pry his fender off his tire with a crow bar. I waved and the medics came over to me. “Are you injured?” Was the first question. “I was hoping you could tell me.” I was done with the song and dance. I was done. One of the guys was about as helpful as the 911 dispatcher. He just looked at me, waiting for my self-diagnosis. The other guy started an exam. “Do you need to go to the hospital?” The unhelpful medic was looking at me again. “I don’t know? Do I?” It was almost like we were all playing some big game with secret passwords that I didn’t know. By the time LAPD had arrived, we’d exchanged info, taken pictures, and speculated about whether each car was a total loss. It took another half hour before we called tow trucks and got everything out of the street. I know it’s LA, and there are more pressing things calling on the police, but seriously, I don’t think it’s the greatest idea to expect people who have just been in a pretty major accident to determine their injuries, evaluate each other’s documents for validity, direct traffic, and clean up the site of an accident.